While waiting for my train I walked around and saw this. Seeing the symbol of Amsterdam made me think for a moment. Then I thought a bit more and it struck me. Why not reflect on Amsterdam’s values? Life and work in Amsterdam certainly changed me as a person. “Vastberaden” is the Dutch word for being persistent. You want to get things done? Persist, hang in there and do what you have to do. “Heldhaftig” is the Dutch word for being courageous. In short when you have to confront something or someone, you do it. You do not run away. “Barmhartig” is an old word. It means to be hospitable and kind to others. Think of meeting a person who gives you meal when you are hungry and gives you shelter when you do not have a place to go. Such (altruistic) people are rare. 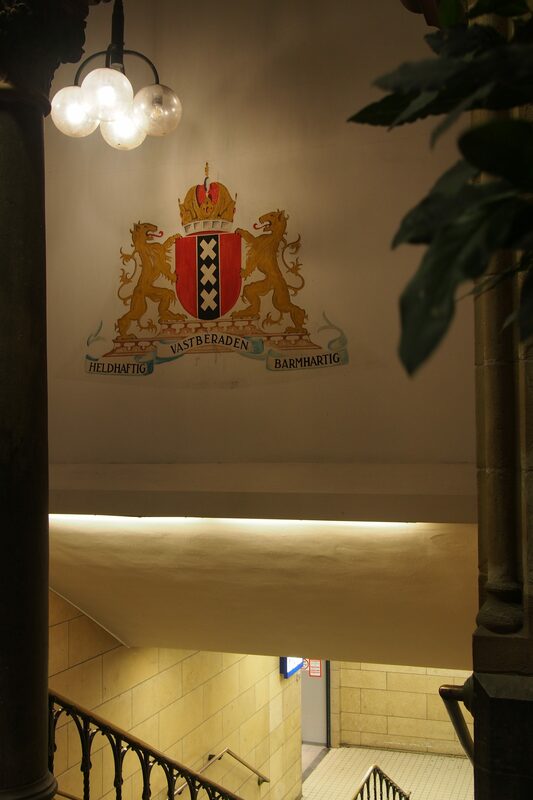 When I came to Amsterdam to study there I felt lost. The first few months I was adapting to everything. If anything I was a wimp used to a quiet town. Yes compared to London or Shanghai Amsterdam is small. For Dutch standards though, Amsterdam is a big city in the Netherlands. When you do not adapt you cannot settle here. Courage is important in Amsterdam. Sure you do not have to go Spartacus. Thing is, when you do not stand up for yourself people will walk over you. Sometimes you have to say “no” and do your own thing regardless of what others say. Some people call this quality individualism but I think that falls a bit short. To be hospitable and kind is difficult. Here is the thing: who can you trust? Some people have good intentions and are harmless. Some people have different intentions and can be dangerous. My experience is that once you adapt well enough to life in Amsterdam you can spot the people you should avoid. Looks do not matter, verbal and physical behaviour matter. Amsterdam is the testament that people can win against the water and build a city on a marsh close to the sea. Think about it. Centuries ago the first settlers persisted in keeping the water at bay, had the courage to expand a small settlement and welcomed other people to live near the Amstel. Posted in Short Reads and tagged Amsterdam, barmhartig, being courageous, being persistent, heldhaftig, hospitable, kind, life, people, values, vastberaden, work on November 25, 2016 by rura88.